The EMC Storage Plug-in for Oracle Enterprise Manager 12c is the next generation of EMC’s storage plug-ins for Oracle Enterprise Manager and brings new insight to the Oracle DBA using EMC storage for his/her databases. While previous versions of the plug-ins were specific to different EMC storage systems, this brand new version has been completely re-architected and is designed to work with a range of EMC storage systems including VMAX, VMAX 3, VNX Block, VNX File, and XtremIO. The EMC Storage Plug-in for OEM 12c gathers availability, performance, and configuration information for EMC Storage Systems and marries that information with Oracle database host information. This provides the DBA with a comprehensive look into the performance of the specific storage used by each database – significantly simplifying the task of tracking database performance and isolating issues. Gain enterprise-wide visibility into EMC Storage. 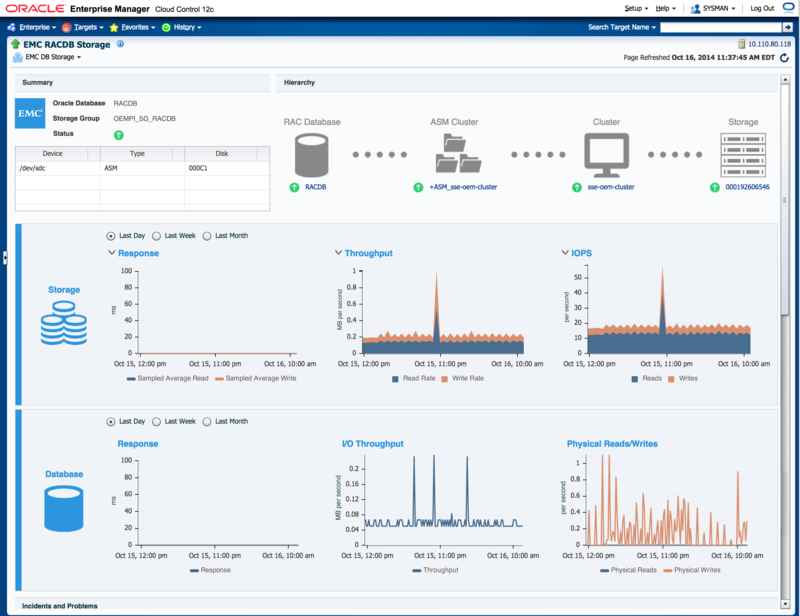 Makes available EMC storage related performance, health, and availability metrics within OEM. Enhanced plug-in interface targeted at providing EMC storage analysis. Relationship mapping between EMC storage and Oracle Databases. Greatly reduce troubleshooting times, and simplify security & compliance management. Integration between OEM and EMC Storage delivers reduced MTTI & MTTR. Customizable Information Publisher Reports and historical metric collection assists troubleshooting, diagnostics, and analysis.